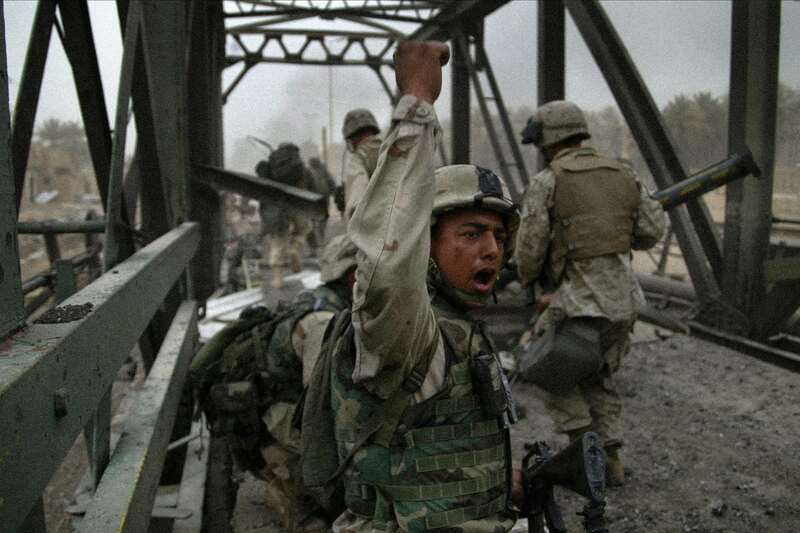 Invasion: Diaries and Memories of War in Iraq features the remarkable war diaries of Marine Lt. Timothy McLaughlin, along with texts by Peter Maass and photographs by Gary Knight. The exhibition presents three different experiences of the invasion from within the same unit and is timed to the 10th anniversary of the invasion of Iraq. Conceived and designed by Knight and Maass, the exhibit breaks new ground in documentary storytelling. The exhibit displays an innovative grid of 36 pages from McLaughlin’s diaries, each page blown up to poster-size. McLaughlin was at the Pentagon on 9/11, commanded a tip-of-the-spear tank during the invasion of Iraq, and his American flag was memorably draped on a statue of Saddam Hussein at Firdos Square when Marines entered Baghdad. In the pages, McLaughlin writes of stumbling through the smoke-filled Pentagon after it was attacked, of the Iraqis shot and killed by his tank’s guns in 2003, and of the chaos when his flag was placed on the statue in front of a global television audience. The grid, which includes pages with pictures, maps and poems, operates as a text about war and also an artwork about war. Because McLaughlin’s account is in his handwriting, rather than the flat look of a computer font, its impact is unusually personal and emotional. 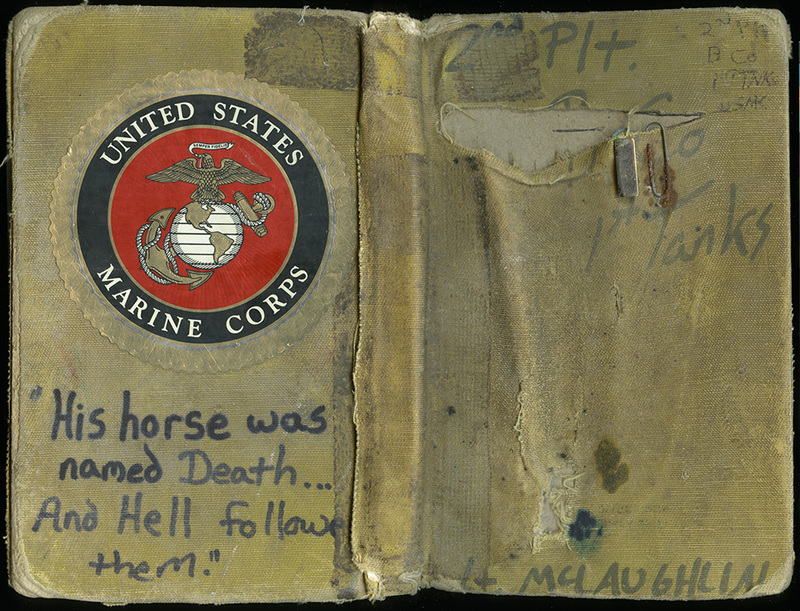 On select days, including opening night, the exhibit will feature the flag, which McLaughlin kept in a safe-deposit box after returning from Iraq. One of the diary pages in the exhibit describes the flag-raising at Firdos Square: “Swamped by mass of reporters—could not move/peace protester ‘How many children have you killed today.’ Capt. Lewis sent me back to get flag.. Chin draped it over Saddam’s face...Got flag back—people tried to get it from me.” This will be the flag’s first public display since it was raised in Baghdad. The exhibit evokes the invasion in a multi-dimensional way, with an innovative mix of visuals, text and sound. Knight and Maass, driving SUVs they had rented in Kuwait, reported on the battles fought by McLaughlin’s battalion as it approached Baghdad; the exhibit includes their award-winning work. Knight’s photographs were featured in Newsweek, while Maass’s stories were published in The New York Times Magazine and the New Yorker. The exhibit also features a video installation using news footage from 2003 to enhance the atmosphere of the invasion era.